A couple of weeks ago I received an inquiry from a sales team leader asking about our sales training and coaching services. As with all inquiries like this, the first thing I did was to ask why they felt that sales training and/or coaching was the right solution. The answer I got was quite typical. They told me that while some salespeople were doing well, the bulk of them were only doing okay and there was tremendous inconsistency in performance. They said they’d like to see their salespeople be more aggressive, to penetrate accounts more deeply and generate a greater velocity of sales opportunities. 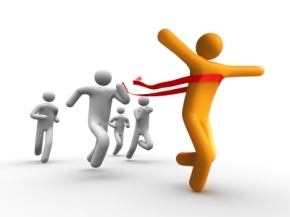 How are leads managed and nurtured? What happens with a lead before it gets in the hands of a salesperson? How is the progress of leads tracked through the funnel? How are you using your website to aid in the lead generation and sales process? What personas are you focused on? Why would a qualified prospect choose you over alternatives (including, but not limited to your competitors)? As my inquirer was attempting to answer these questions, it became increasingly clear that while their salespeople certainly would benefit from training and coaching, the problem they were trying to solve would not be solved with coaching and training alone. Don’t get me wrong, I expect a lot from salespeople. Frankly, I think there are far too many companies that have been far too weak on their expectations from their salespeople. They’re now waking up and realizing they have a problem and they’re blaming the wrong people. The salesperson is no longer the first point of contact for education or inquiry. Depending on the source you use, the first place B2B buyers go to learn about products and services is online 78 – 90% of the time. If you haven’t totally altered your web presence to support this, you may never get a chance to make a sale. The number of people involved in a sale has multiplied and companies have become increasingly consensus driven. Research from the likes of MarketingSherpa, Marketo, IDG and CEB highlight that anywhere between 10 and 21 people will be involved in making a B2B purchase decision. This is far more than any salesperson can manage on their own. The nature of how purchase decisions are made has changed. Historically a star sales rep could make a high-impact case to a senior executive and watch the executive bring along the rest of the organization. Today it is increasingly common that the senior executive wants to see consensus from below before entertaining any type of decision. This means that sales processes must be built to span more of the buyer’s organization than ever before. Lastly, the nature of competition has changed. Before “the great recession,” you competed against others who did, at least, something similar to what you do. With the disappearance of discretionary budgets more decisions than ever are viewed through a comprehensive prism from the buyer. So you’re competing with every solution a prospect is considering. We can argue about how much of the buyer’s journey is done online before a salesperson is involved; but we can’t argue that your web presence is crucial to successful selling. Your website needs to be viewed through the prism of sales. Your website is on-call 24-hours a day, 7-days a week. Today a primary executive or influencer may be bored on a Thursday night (or Sunday morning) and decide to go online to deal with the issues they’re working on. Additionally, the way an influencer will introduce your company or offerings to someone else internally is to point them to your website. If your website isn’t built to win those opportunities, your likelihood of success drops precipitously. Is Your Message Clear, Concise, Consistent and Powerful? The answers we get are typically rambling and inconsistent from one person to another. When we go to the website to see how a message is communicated, it is typically boring, highly conceptual and promises the same things everyone else does (honestly if I see one more website promote an offer as best-in-class, innovative and/or how they “maximize performance,” I might just puke). Guess what? In today’s world you don’t get to ask those questions before delivering a personalized message. Today you must communicate your commercial teaching point-of-view before you get a chance to influence. Are you allocating enough of your attention and resources to the top of the funnel? The way buyers buy today has changed (did I mention that already). B2B organizations are far less likely to make quick decisions. They spend far more time socializing issues (whatever that means – actually it means they spend a lot more time building consensus before even recommending a course of action). This means that even if you happen to have a relationship with the right person at the right company and they have the right need, you’ll still have a top of the funnel problem if you haven’t already addressed it. The top of the funnel is all about teaching the problem and addressing the impact. The “sale” you're making here is focused on why it is imperative that the issue you are talking about should be focused on and addressed. If you haven’t built the assets to support this, it’s absolutely unfair to ask your salespeople to close more business faster. 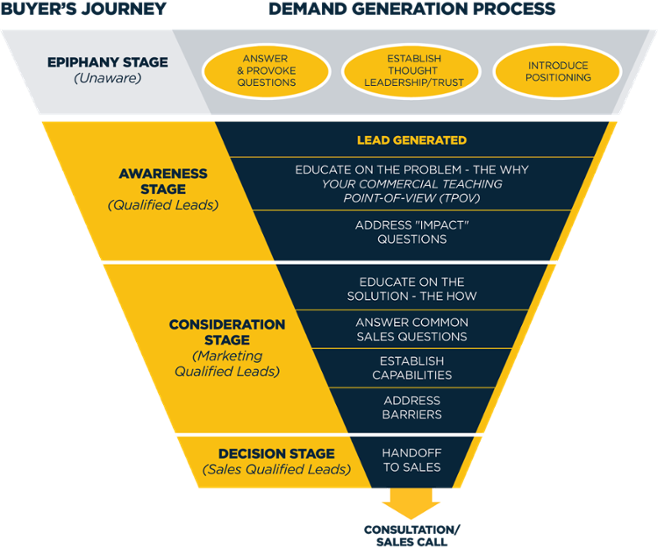 Are you tracking progress through the entire demand generation funnel? At Imagine, we subscribe to the W. Edwards Deming philosophy, “In God we trust, everyone else better have data.” If you’re not maniacally tracking the entire revenue generation process from gaining interest through closing business, then you’re just guessing at what needs to be done. I’ve lost the number of times that I’ve been brought in to a sales organization to address a closing problem when it turns out that the real problem lies in the positioning and lead generation strategies being used. Additionally, if I’m not monitoring the entire process then I can’t accurately diagnose problems or take advantage of clear opportunities. Are your salespeople spending 80% or more time on their highest/best use? The time and dedication it takes to manage a B2B sale today is greater than ever before. For most companies the decision to pursue a bona fide opportunity costs the selling organization tens to hundreds of thousands of dollars. What’s never made sense to me is why companies that are making such an investment would risk losing the focus of those responsible for successfully managing that process. If you’re asking your sales team to prospect, manage and close sales opportunities, don’t expect a high output. Sure, some outliers will put up great numbers (and executives will whine, “why can’t all of our salespeople put up numbers like that?”), but the reality is that juggling those responsibilities takes variant skills, and a lot of time and energy. If this is your approach (and it’s the dominant approach for small and mid-market companies) then you should expect inconsistent and highly variant results. Research supports that specializing responsibilities increases the velocity and success of your sales efforts. By clarifying roles and responsibilities to specific salespeople you’ll gain far greater efficiency and effectiveness throughout your entire revenue generation process. One of my favorite observations from the famous book The 7 Habits of Highly Effective People is around the idea that it’s more important to be doing the right things, instead of doing things right. If you’re looking to drive real, sustainable results from your selling efforts and you can’t confidently answer the previous five questions affirmatively, sales training or coaching isn’t going to solve anything. Investing in it is like working on ways to get from Boston to Florida faster, when it turns out that you need to get to Seattle. Build the demand generation process that puts salespeople in a position to be successful and then hold them to a (very) high standard. Everyone will be glad you did.